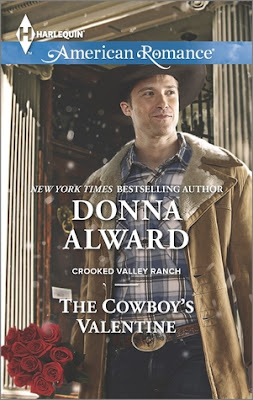 The Cowboy's Valentine by Donna Alward attracted me because of the blurb and because I just love cowboys! This is such a sweet and well written book. Despite being part of a series, it can be read as a standalone. The enjoyed meeting Lacey and Quinn. Quinn lost his wife and has a young daughter to look after. He works as the ranch manager of the ranch that belongs to Lacey's family and which she has inherited. Lacey lost her husband and her dreams of happy family and the last thing she wants is the part ownership of a ranch she has no idea of running. The clash of ideals and preconceived notions between Quinn and Lacey made for some interesting times and the emotional upheaval in their lives had me going misty eyed often. I loved meeting Lacey's brother and sister-in-law and am now intrigued to read their story. Quinn;s daughter is just so sweet and won my heart right form the start. I rooted for a happy family for her and a happily-ever-after for Quinn and Lacey. These characters deserved a happy ending and were so suited to each other. A clean, enjoyable and engaging romance, I loved The Cowboy's Valentine and give it 4 stars out of 5. Recommended to all romance lovers, go read this book and enjoy!